Is your home earthquake ready? If it's not, there's a way to get it ready. The California Earthquake Authority wants to help homeowners prepare for the "big one" and save money at the same time. Even residents who own old homes can take advantage of a retrofit grant program. The U.S. Geological Survey predicts the Hayward Fault is the biggest threat for a massive quake because 2 million people live directly on the fault, and it's overdue for another major quake. Now the CEA is hoping a lottery of sorts will help convince thousands to retrofit their homes. Patricia Maurice recently bought a home in Oakland, and she decided she would take advantage of the CEA's Earthquake Brace and Bolt program to protect that home from an imminent earthquake. "I don’t think the house is going to collapse," Maurice said. "It might move a bit, but I don’t think it’s going to collapse on top of me, which was something that I stayed up at night worrying about." The Brace and Bolt program gave her a $3,000 check that allowed her to retrofit her house, which was built in 1927. It's offering others similar grants if they qualify. "I wouldn’t have done it if there wasn’t a subsidy because I don’t have a lot of money," Maurice said. 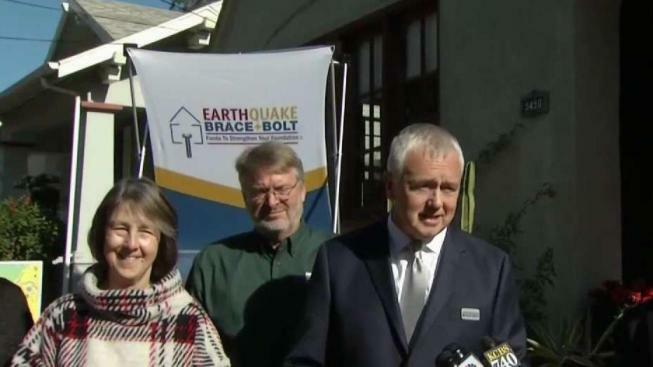 Janiele Maffei, executive director of Earthquake Brace and Bolt, said participants are avoiding damage that can be in the hundreds of thousands of dollars. The process takes about two days, and residents can stay in the house while it happens. First, the foundation is bolted down, which prevents the house from sliding. Second, plywood is added to the cripple walls to prevent the house from collapsing. "I’m not an engineer, but I’ve done everything I could, and that makes me feel much better," Maurice said. Registration for the program began Tuesday. To register or determine eligibility in the 2019 Earthquake Brace and Bolt program, visit the program website.